Approximately 20% of paediatric patients with epilepsy are refractory to medical therapies. In this subgroup of patients, neuroimaging plays an important role in identifying an epileptogenic focus. Successful identification of a structural lesion results in a better outcome following epilepsy surgery. Advances in imaging technologies, methods of epileptogenic region localisation and refinement of clinical evaluation of this group of patients in epilepsy centres have helped to widen the spectrum of children who could potentially benefit from surgical treatment. In this review, we discuss ways to optimise imaging techniques, list typical imaging features of common pathologies that can cause epilepsy, and potential pitfalls to be aware of whilst reviewing imaging studies in this challenging group of patients. The importance of multidisciplinary meetings to analyse and synthesise all the non-invasive data is emphasised. Our objectives are: to describe the four phases of evaluation of children with drug-resistant localisation-related epilepsy; to describe optimal imaging techniques that can help maximise detection of epileptogenic foci; to describe a systematic approach to reviewing magnetic resonance imaging of children with intractable epilepsy; to describe the features of common epileptogenic substrates; to list potential pitfalls whilst reviewing imaging studies in these patients; and to highlight the value of multimodality and interdisciplinary approaches to the management of this group of children. One must first define the seizure syndrome and ensure that medical therapy is optimised; this includes a detailed history, including pre- and postnatal events, seizure history including the semiology (type of seizure), characteristics of onset and manifestations of the seizures, a full neurological examination, detailed electrophysiology via several electroencephalography (EEG) exams that record interictal and ictal events, and neuroimaging. Functional imaging with single-photon emission computed tomography (SPECT) and/or positron emission tomography (PET), functional magnetic resonance imaging (fMRI) and magneto encephalography (MEG) are also used in some cases. Results are discussed at multidisciplinary team meetings involving specialists in neurology, neurosurgery, neurophysiology, neuroradiology and neuropsychology. If the anatomical and functional images are concordant with the seizure semiology and information gathered is considered adequate, surgical resection may be planned. If there is no concordance of data, further testing may be required, such as hospital admission for continuous scalp EEG or video-telemetry to better define the seizure frequency and semiology, particularly if the seizures are predominantly nocturnal or ill-defined on routine EEG. Neuropsychological testing helps to assess baseline performance, the level of neurodevelopment, deficits in various domains including verbal and non-verbal communication, and psychosocial factors. This evaluation helps in documenting the extent of premorbid damage and predicting possible outcomes following epilepsy surgery. Invasive monitoring is used to further lateralise and localise the seizure focus that remains incompletely defined by noninvasive studies in Phase 1 or to determine the location of the seizure focus relative to eloquent cortex. Comprehensive review of the data is done by the epilepsy team, to confirm concordance of findings; and to decide if surgery is the best option (either curative or palliative). The postoperative assessment is routinely performed 6-24 months after the surgical procedure to document the final outcome. Neuroimaging is recommended when localisation-related epilepsy is known or suspected, when the epilepsy classification is in doubt, or when an epilepsy syndrome with remote symptomatic cause is suspected. MRI is the modality of first choice. Aims of structural imaging include locating the epileptogenic region, providing a surgical planning map, defining the relation of a focal lesion to eloquent areas, and as a base for functional studies including PET, SPECT, fMRI and MEG. In the last decade, advances in scanner hardware and software have improved the rate of detection of epileptogenic lesions. Wherever possible, a high-resolution protocol on a 3T scanner is preferred as it improves the pre-surgical evaluation in focal epilepsies. As 3T MRI scanners are rarely available in developing countries, epilepsy protocols should be optimised when using 1.5T. Based on the recommendations by consensus panels of the ILAE3 and the author's personal experience, the following MRI protocol sequences are recommended in children with epilepsy, irrespective of the strength of the MRI scanner (Box 1). With 3T MRI scanners, a 3D sagittal fluid-attenuated inversion recovery (FLAIR) with multiplanar reformats is recommended to look for focal cortical dysplasia. In lieu of this, a coronal FLAIR can be used at 1.5T scanning the whole brain. Thin section, no-gap axial T2 (3 mm - 4 mm thick slices) is recommended. Increasing the number of averages or number of excitations to increase the signal-to-noise ratio at 1.5T may be employed; this generally means a longer scan time and may call for sedation of younger patients. A susceptibility-weighted imaging (SWI) or gradient echo sequence can be added to the protocol in populations with higher incidence of calcified lesions such as tuberculomas and in patients with neuro-cutaneous syndromes. Isotropic motion-compensated multi-echo T1W magnetisation-sprepared rapid gradient echo allows optimal characterisation of the cortical outline in three planes. The author includes a diffusion tensor imaging sequence (35 diffusion directions, 3 mm slice thickness, b value of 0 and 1000 seconds/mm2) in all patients to produce tractography maps for surgical planning in patients with lesions in eloquent areas and arterial spin labelled images to assess perfusion without the need for a contrast medium. MR spectroscopy and contrast-enhanced imaging is reserved for selected cases. Axial and coronal T2-weighted images are usually the starting point to look for cerebral hemispheric asymmetry (both size and signal intensity), gyral folding pattern, blurring of the gray and white matter junction, and symmetry of the white matter signal. Following this, volumetric T1W images are reviewed and assessed for midline structures including the hypothalamic region, gyral folding pattern, cortical thickness, sulcal asymmetry, uniformity of cortical signal, and subcortical and periventricular gray matter lesions. Finally, the hippocampi and temporal lobes are reviewed in detail. At this point, available EEG reports and the seizure semiology are reviewed and, based on this information, the areas of concern are reassessed on MRI. FCD Type I - Type 1A: abnormalities of cortical lamination (Figure 1). Type 1B: abnormal tangential cortical lamination. Type 1C: abnormal radial lamination. FCD Type II - Type IIA: abnormal cortical dyslamination and dysmorphic neurons without balloon cells. Type IIB: with balloon cells (Figure 2). FCD Type III - Type IIIA: includes FCDs with an associated lesion such as hippocampal sclerosis (Figure 3). Type IIIB: an epilepsy-associated tumour. Type IIIC: vascular malformation. Type IIID: other lesions. Features of FCD on MRI include cortical thickening (which should be confirmed in at least two planes and on two different imaging sequences), blurring of the gray and white matter junction, T2 and FLAIR hyperintensity in the cortex and adjacent subcortical white matter, T1 shortening in the cortex and abnormal sulcal/ gyral pattern. 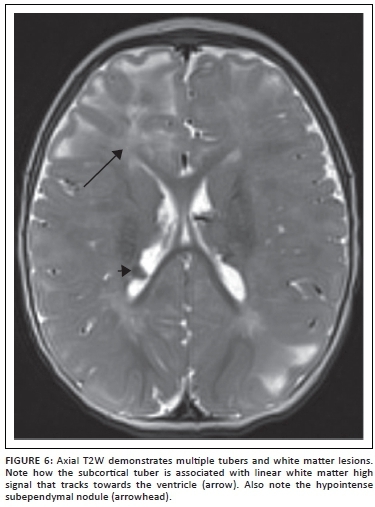 MRI is able to show abnormalities in the majority of Type II dysplasias but only in some of the Type I cortical dysplasias although, in practice, it may be possible to distinguish between Type I and Type II.7 The typical appearance of FCD Type IIB (with balloon cells) is a band of hyperintensity on T2-weighted and FLAIR images extending from the gray and white matter interface to the surface of the ventricles (Figure 2). To visualise this often subtle finding, multiplanar thin-section images should be performed. At 3T, volumetric FLAIR with multiplanar reformats is an excellent sequence to look for the white matter hyperintensity characteristic of Type II FCDs. 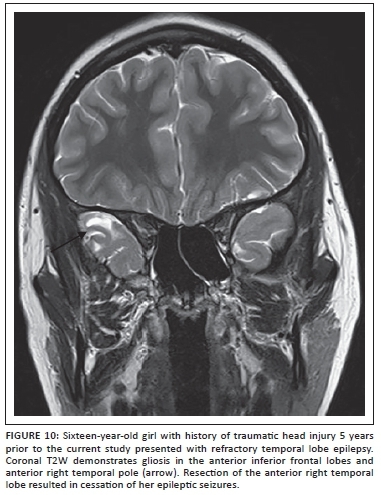 Mesial temporal sclerosis (MTS) is an uncommon finding in children. Although some studies have shown a high correlation with epilepsy, hippocampal atrophy and T2 prolongation can also be seen in asymptomatic subjects.8,9 An important factor that contributes to earlier detection of mesial temporal sclerosis in children is the use of dedicated epilepsy protocols which include thin-section coronal T2 and FLAIR perpendicular to the hippocampus. An initial event such as prolonged febrile seizures, prior infection, trauma, factors that increase vulnerability to neuronal injury such as hippocampal dysgenesis together with genetic predisposition are thought to work in tandem for MTS to develop. The author has reported on young children presenting with seizures that are accompanied by diffusion restriction in the hippocampus acutely followed by development of MTS within the next 2 years.10 Findings that suggest MTS include: hippocampal T2 hyperintensity, reduced hippocampal size, loss of hippocampal interdigitations, atrophy of the collateral white matter, reduced gray and white matter differentiation in the anterior temporal lobe, decreased temporal lobe size, and ipsilateral temporal horn enlargement (Figure 4). MTS is widely acknowledged to be a progressive disease; however, the secondary signs of MTS including ipsilateral fornix and mammillary body atrophy are very uncommon in children. It is important to look for dual pathology including cortical dysplasia and neoplasms, as the prevalence of dual pathology after temporal lobe resection has been reported to range between 12% and 79%.11,12,13 It is also necessary to evaluate for bilateral MTS as this can change the management plan, particularly in patients with bilateral seizures and bilateral EEG abnormalities. Other techniques with varying degrees of success have been described, including voxel-based morphometry, voxel-based diffusion tensor imaging and T2 relaxometry analysis to detect MTS, but are not routinely used.14,15,16 Sub-millimetre-high resolution scans using 64- and 128-channel coils are being investigated by various groups including the author's, as earlier detection and treatment of MTS can help to reduce the cognitive and developmental morbidity in these children. 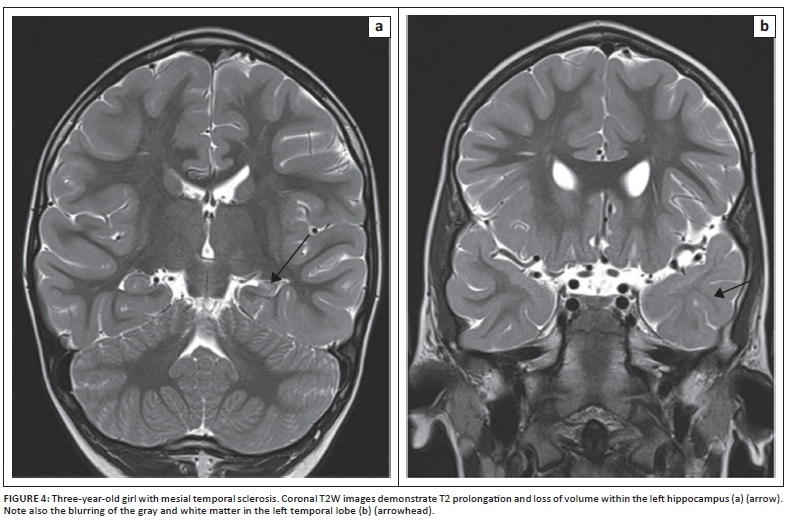 Sturge-Weber syndrome (SWS) is a neurocutaneous disorder clinically characterised by epilepsy, progressive mental retardation, and facial telangiectatic nevi, often in the trigeminal nerve distribution. MRI is the most useful imaging study in the first year of life, as an abnormal scan is the best predictor of adverse clinical outcomes in these patients. Most authors agree that a gadolinium-enhanced brain MRI should be performed within the first 3 months of life, with the caveat that a negative result should not be considered conclusive if neurological symptoms develop.17 On MRI, the main findings of SWS are cerebral atrophy, white matter abnormalities in the region of the leptomeningealangiomatosis, hypertrophy of the overlying calvarium, and congested deep cerebral veins. Contrast should always be used when evaluating a child with suspected SWS to demonstrate the enhancement of the superficial gyri and define the extent of leptomeningeal vascular abnormality, even before the rest of the abnormalities become visible (Figure 5).18 MRI perfusion studies are useful in detecting perfusion defects. Assessment of the contralateral hemisphere is especially important as bilateral involvement is well recognised. Tuberous sclerosis complex (TSC) is a multisystem genetic disorder of variable phenotypic expression, with an incidence of about 1 in 5800 live births worldwide.19 The disorder results from a mutation in the TSC1 gene in chromosomal region 9q34 or the TSC2 gene in chromosomal region 16p13, and is inherited in an autosomal dominant fashion. Up to two-thirds of cases result from spontaneous genetic mutation. Clinical manifestations of tuberous sclerosis include seizures, autism, developmental delay, and behavioural and psychiatric disorders. Epilepsy is common in patients with TSC, occurring in up to 90% of affected individuals during their lifetime.19 Up to one-third of children will develop infantile spasms. Although not completely understood, the incidence of epilepsy is thought to relate to the neuropathologic features of the disorder, including cortical tubers and other dysgenetic features. Individuals with TSC frequently have epileptiform features on their electroencephalograms. In addition to medical therapies, surgery plays an important role in the management of children with drug-resistant epilepsy in TSC. 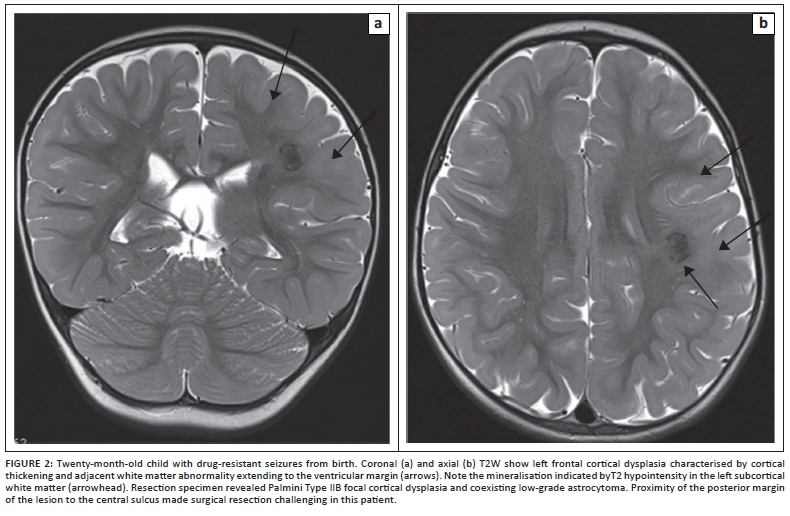 The focus of pre-surgical evaluation in these patients is to identify the most epileptogenic tubers by multimodality non-invasive tests, including using a combination of MRI (Figure 6), PET (including [(11) C] methyl-l-tryptophan-positron emission tomography [AMT-PET]), ictal and interictal SPECT, and MEG. Based on this evaluation, a subset of patients with TSC can become suitable candidates for surgical resection. In some cases, subdural electrode placement may be required to identify a single or conglomerate of epileptogenic tubers. 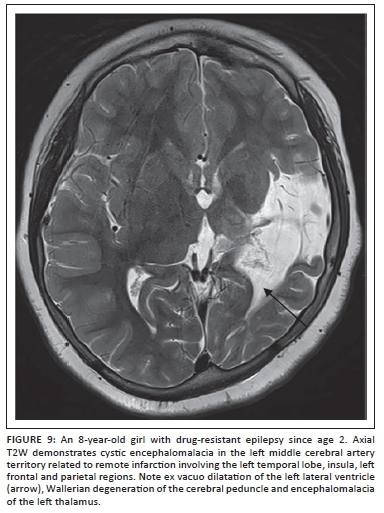 Neoplastic lesions associated with drug-resistant epilepsy are usually cortically based and may remain indolent for many years prior to presentation. The vast majority of tumours are located in the temporal lobe and the most frequent tumour type is aganglioglioma, followed by pilocyticastrocytomas and dysembryoplastic neuroepithelial tumors (DNET) (Figure 8).21 In addition to imaging and characterising the tumour, it is important to evaluate for coexisting pathology, such as mesial temporal sclerosis in cases of temporal lobe neoplasms. The epileptogenic area should carefully be determined by non-invasive and/or invasive EEG recordings of the zone of seizure onset and persistent interictal activity. Also, imaging in many cases includes functional studies including functional MRI and/or the Wada test. Based on this pre-surgical evaluation, complete resection of the tumour and any surrounding abnormalities helps to reduce seizure frequency in a large number of cases. Follow-up studies should be tailored to evaluate for tumour recurrence (and therefore necessitating use of contrast medium in most cases) and residual abnormalities in cases where seizure reduction does not occur as expected. There is a significant risk of developing epilepsy after perinatal stroke, hypoxic-ischaemic injury, and intracerebral haemorrhage (Figure 9). Seizures can become refractory to medications in approximately 25% of these patients.22 Challenges in managing seizures in these patients include multifocal or bilateral cortical injury, non-focal or poorly lateralising video electroencephalography (EEG) findings, and limited functional reserve. Seizure onset zone may not be limited to the abnormality identified on imaging studies, and subdural electrode placement for invasive monitoring may be required. In addition to acquiring a functional MRI, we track the corticospinal, visual and language pathways using diffusion tensor imaging and tractography to aid the neurosurgeon in developing a resection plan. When surgical resection is planned using this approach, functional outcomes are generally good in this group of patients, with improvements in independence, quality of life, cognitive development and motor skills, despite transient postoperative monoparesis or hemiparesis and occasional mood disorders. 1. Normal variants can be problematic, particularly in the temporal lobes; for example, incomplete inversion of the hippocampus can be seen in asymptomatic individuals. 2. Dual pathology has been reported in approximately 15% of patients. In view of this finding, a careful review should be carried out even if a lesion is identified in the initial phase of the scan review. In cases with a convincing unihemispheric abnormality, it is extremely important to review the contralateral hemisphere for subtle anomalies as this may alter management. 3. 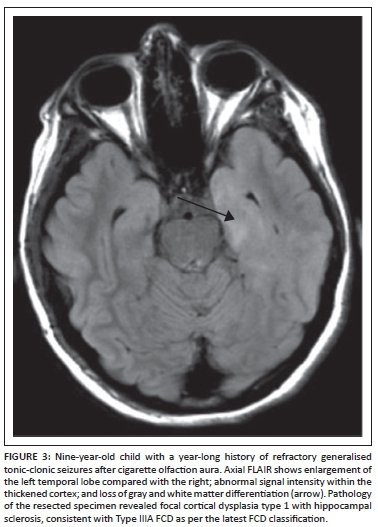 Neoplastic lesions can masquerade as cortical dysplasia. Clinically, this should be suspected in cases where seizures are of relatively recent onset, and on imaging when cortical thickening is accompanied by large overlying vessels with avid lesion enhancement post contrast. 4. There are documented cases, albeit rare, where the detected lesion was unrelated to the ER. 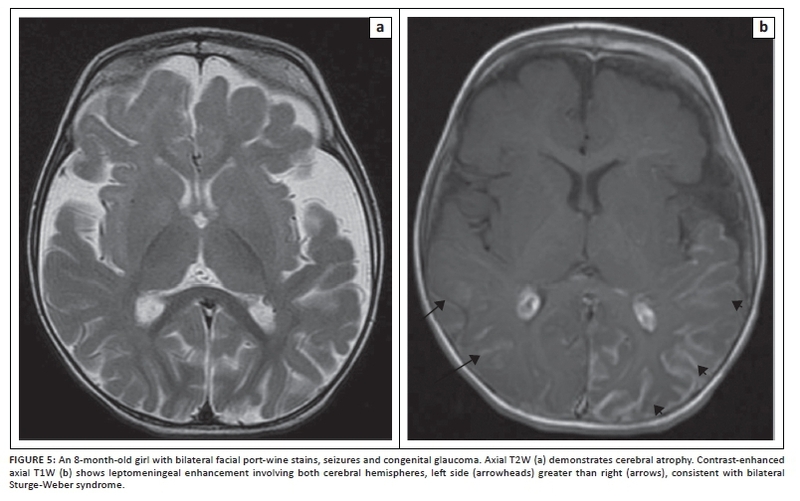 The presence of multiple lesions (e.g., tuberous sclerosis or nodular heterotopias) does not necessarily mean that seizures are multifocal in onset. 5. Focal lesions, particularly FCDs, can be masked between the ages of 6 months and 2 years owing to incomplete myelination. In these cases, repeat imaging is recommended every 3-6 months and, if tolerated, after 2 years of age. Also, one should evaluate any scans available from the neonatal period, as these may reveal the extent of cortical malformations of cortical development (such as polymicrogyria) before myelination commenced. 6. One of the dangers of focusing attention on a particular suspect location is that it can lead to elevated sensitivity at the cost of diminished specificity. Therefore, it is advisable to make a concerted attempt to exclude other lesions elsewhere at similar sensitivity thresholds. 7. 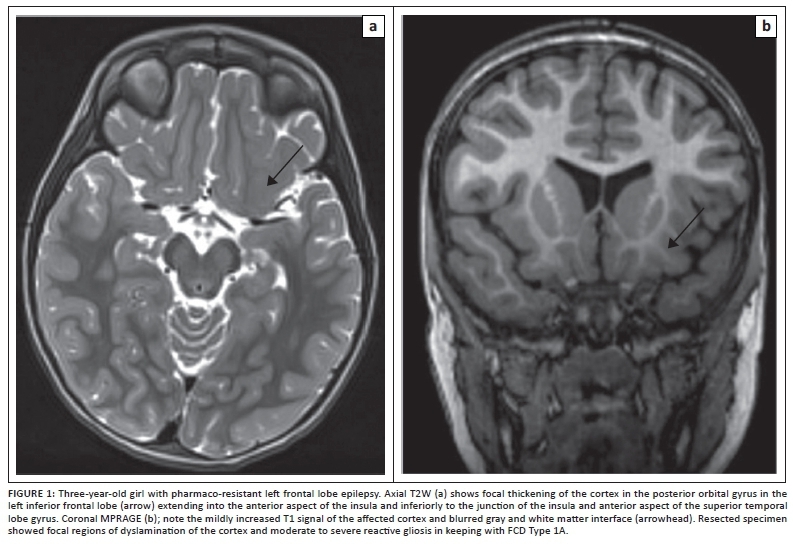 In MRI-negative patients with drug-resistant epilepsy, serial assessment is advised to document temporal consistency of localisation and attempt to exclude other aetiologies such as genetic/idiopathic (e.g. SCN1A epilepsies), auto-immune (e.g. NMDA), voltage gated potassium channel (VGKC), and neurodegenerative syndromes. Repeat MRI should be considered after completion of myelination around 2 years, preferably on a 3T scanner. In non-lesional cases, one or more ancillary tests are required to allow a hypothesis for ER location that can then be confirmed by either ECoG or IEM. 8. Imaging studies performed on patients with persistent seizures after resection of a lesion determined as epileptogenic, or surgical procedures such as callosotomy or functional hemispherectomy, should be compared carefully with preoperative studies. This comparison should examine for completeness of resection and for a second lesion that was not detected during the workup for the first procedure, particularly if the seizure semiology changes after the first surgical procedure. The summary of the information gathered from various non-invasive tests including neuroimaging studies should be analysed and discussed at multidisciplinary team meetings. This may entail amending prior interpretation of tests in the light of collective information. Subtle FCD lesions become apparent on MRI that has been reported as normal; this may be because of 3D reconstruction of multimodality data to assess convergence or plan intracranial electrode placement or surgical navigation. The case discussion is aimed at defining surgical candidacy, goals of the procedure chosen and guiding future patient management strategies. One of the key decisions at this conference is to decide between hemispherectomy versus tailored focal resection. In patients with extensive unihemispheric pathology such as hemimegalencephaly, Sturge-Weber syndrome and hemispheric stroke documented on MRI, no additional tests are generally required. In cases where the scalp EEG abnormalities appear more prominent over the contralateral normal hemisphere, the MRI should be carefully re-evaluated for subtle occult pathology. In some of these cases, the EEG findings may be falsely lateralising, particularly if the clinical semiology is clearly lateralised to the abnormal hemisphere and consistent with the MRI lesion. In these cases, the radiologist can help to reduce aggressive pursuit of additional unnecessary testing by clearing the contralateral hemisphere. New MRI techniques include isotropic motion-compensated multi-echo T1W magnetisation-prepared rapid gradient echo sequence, diffusion tensor imaging and tractography maps, MR spectroscopy and arterial spin labelled images to assess perfusion without the need for contrast medium. Additional functional imaging with SPECT and/or PET and, in some cases, fMRI and MEG is also utilised in some cases (Figure 11). Advances in neuro-imaging continue to improve the rates of detection of lesional substrates in paediatric patients with epilepsy. It is important to utilise tailored MRI protocols as described above on the best scanner hardware available. Further, a systematic and meticulous approach is key to evaluating these scans, which should be combined with information from other modalities at a multidisciplinary conference to define possible candidate lesions for surgical resection. We are indebted to the Department of Epilepsy, Royal Children's Hospital, Melbourne, Australia, and Boston Children's Hospital, Boston, USA, and the RSNA Derek Harwood Nash International Fellowship 2013 which N.M. completed at Boston Children's Hospital. S.P. (Boston Children's Hospital) wrote the article and contributed all the cases. N.M. (University of the Witwatersrand) conceptualised the article, proposed the concept to the editor of the SAJR, adapted the article to a South African audience, edited the article and was responsible for addressing all the reviewers' comments.